I asked my lovely step-daughter Kadesha to assist me with this post because she is a busy, working mom, but makes it a point to exercise. Sure she is tired after a long day at work, and then coming home to attend to a busy two-year old, but exercise has become a lifestyle necessity. What are Kadesha’s tips to incorporate activity in her day? Since chasing around a two year old is not enough, after the dinner hour she will put daughter Kyelle in a high chair to wind down before bedtime with some coloring books, crayons and a snack. While baby is occupied in the high chair, mommy manages to put in her Insanity or Pilates DVD and gets to work. She is also mindful of what food she eats and always tries to cook her own meals where she can monitor fat, sugar and sodium. Although the convenience of fast food can be tempting for the busy parents, Kadesha has managed to completely cut this convenience out of her diet by cooking enough meals to last her through the week. Another great tip to keep her eating habits on track is having a big breakfast. This is where she gets her fill of carbs and the most caloric intake of the day. With a full breakfast to start jump-start the day, she is able to stay full, avoid hunger snacking and keep her energy level high. A salad with grilled chicken and fresh vegetables sustains her at lunch and to the dinner hour, while giving her much needed protein and greens. Detoxing is an important part of her routine, and she does this through cleansing herbs and teas. I hope that Kadesha’s tips to maintain health and wellness are as helpful to you as they have been to her. She wants to stay fit not only to look and feel great, but to enjoy a lifetime of happiness and health with her daughter. Do any other parents have tips to adding fitness to their hectic lives? I would love to hear from you. Passing down healthy habits to the next generation. 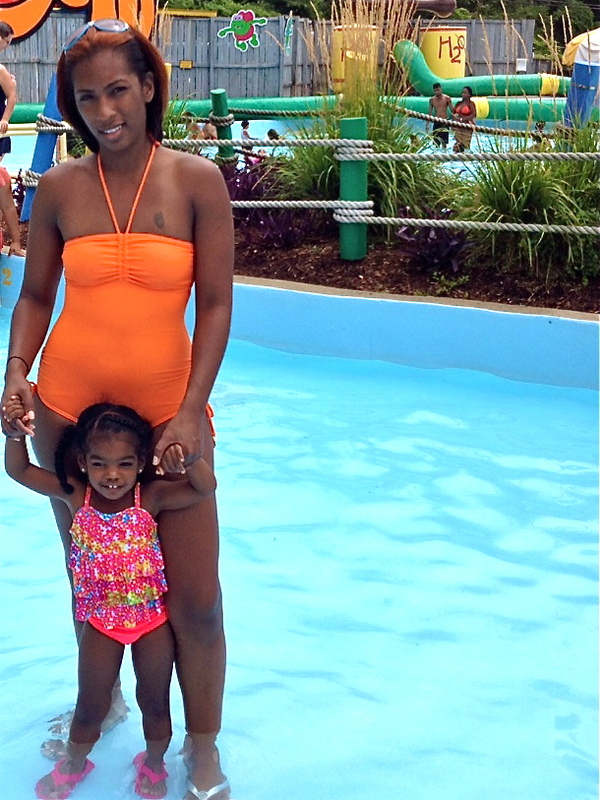 Kadesha and daughter Kyelle enjoy an active day at the pool. It must be very difficult to incorporate exercise in your day with a little one, but you really make it work. Love the blog and the Tips.. Desha girl hats off to you! Thanks for commenting, Simone. She really looks great. And so determined! I have always heard that. A big breakfast really keeps you full. I’m going to try it. I love my healthy snacks too.